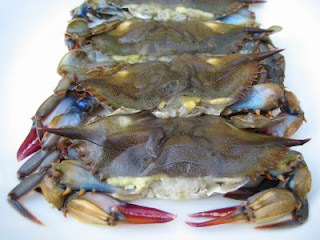 Skinny Soft Shell Crabs - Get Them Before the Season Ends! Where does the time go? It seems like it was just Memorial Day, and here we are on October 1st and the summer has come and gone. One of the last summertime treats that are still available are soft shell crabs. But you better hurry - they will disappear from your fish monger's shelves any day now. In the past, I always prepared my soft shell crabs by dredging them through flour, egg white and panko and frying them in hot extra virgin olive oil. While delicious, that method can obscure the taste of these little gems. 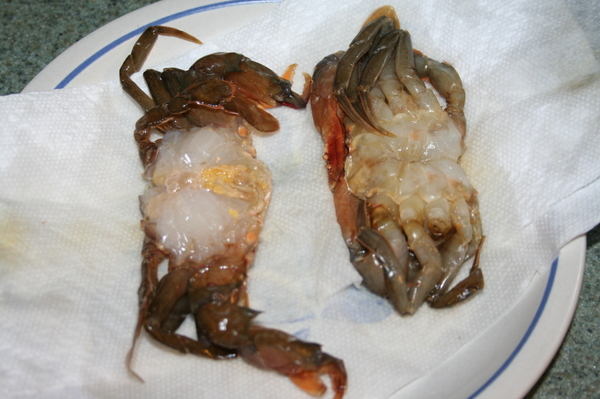 Mark Bittman published an article in the New York Times with many variations of soft shell crab recipes. But he said "less is more" and he's right. I started by drying off the crabs in paper towels. Next, I marinate them in teryaki sauce with sesame seeds, shriracha and extra virgin olive oil. I just put them in the plastic bag they came in, put in the ingredients and let stand on the counter for about an hour. I cook them on my George Foreman grill at 400 degrees for two - three minutes each side with the door open - I used the grill as a griddle. If you don't have an electric grill just cook on the stovetop over medium heat in a non-stick pan with a tablespoon of extra virgin olive oil. Soft shell crabs were really pricey this year. They consistently cost $7.99 per crab all season long. I can recall past seasons when they were between $3.99 - $4.99 each. To keep costs down I just bought one and served on a big bed of grilled baby eggplant. But it's worth the splurge - and I don't think I'll ever cook them using flour/egg white/panko again. You really taste their delicious flavor this way. You could even just cook them in oil if you're a purist! Definitely with soft shell crabs, less is more.